Did you see the Opus on BBC’s Dragon’s Den…? It proved a bit of a star on the popular TV series where budding entrepreneurs seek to raise extra funds for their ventures from experienced business people with money to burn and a hankering to make even more. Except that the folk behind Opus aren’t exactly budding. They have a very successful business in Purple Line, best known for its security products for caravans. But, their ambitions were stretched with this, a concept that’s aiming to make folding campers trendy again. As is the way with “British manufacturing” these days, the Opus is something of an international team effort. Starting point is a BPW chassis, from Germany, while the main bodywork is made in China to Opus’s exclusive specification. Final assembly takes place here in the UK. 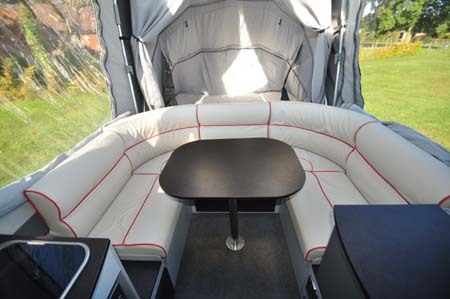 The side panels are a double-bonded aluminium with foam insulation, while the floor is ply with aluminium support. Up front is a gas/storage locker that can take up to two 4.5kg cylinders. Fresh and waste water containers slot either side of this locker for travel. The canvas is a heavy-duty polycotton that’s had a treatment to make sure it stays waterproof as well as maintaining a level of breathability. The window panels overhead really let in the daylight, while side windows are triple-layered – with zip-up curtains, acrylic panels and mesh. On-site, it folds out to an overall length of 5.80m and a height of some 2.75m so, even though it’s well off the ground, there’s more than adequate standing room in the main body. There’s the usual rigmarole of winding down the corner steady at each corner, before getting inside and pushing out the canvas sections and putting some of the furniture units into place, but the whole operation really should be down to 15-20 minutes. 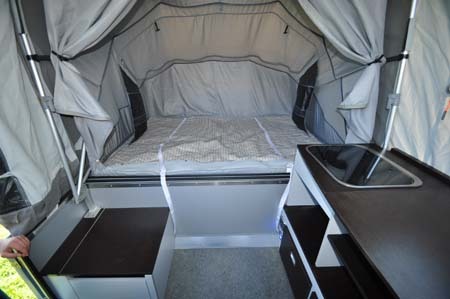 In true folding camper style, you get a bedroom at each end – one of which is beyond the lounge area and will need a bit more scrambling to get to (so, ideal for the children). Each bedroom has a one-piece foam mattress some 1.90m x 1.40m, set on solid board bases. For privacy, you can zip up the canvas. That lounge offers a U-shaped seating area around a pedestal-leg table that should be able to cater for the Opus’s full complement of four, although such a unit as this really does encourage you to be outside as much as possible. And don’t forget a full awning really ups the total living zone. That also means you can consider such amenities as a toilet area (the box in the main living zone is designed to house a portable loo for travel). The kitchen sits along the offside, with cooker and sink units as well as an array of locker storage. Also, a 230V blown air heater is ideal for taking the chill of things at night and first thing in the morning. The example reviewed here has the Ready to Roll pack, which adds another £1,000, but is actually a package that’s too hard to ignore. If you broke down the options individually, you’d get: alloy wheels (£399), Nemesis Ultra wheel lock (£119), roof cover (£49), 25m mains lead (£36), 110ah leisure battery (£119), leatherette interior (£999), Dometic fridge (£349), microwave oven (£99), fresh water carrier (£79), waste water carrier (£79), sun canopy (£299). Compared to a caravan, it’s also easy to stow. 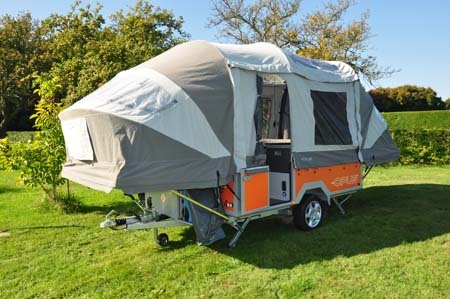 Indeed, without wishing to tempt fate, folding campers don’t tend to be of interest to the criminal fraternity and instances of actual theft are extremely low. In turn, that also means lower insurance premiums. Easy and economical to tow (and you certainly don’t need a hefty, expensive car as a tug), straightforward enough to set up. The folding camper as we used to know it has been given a funky make-over. Deborah Meaden is in…now it’s over to you! 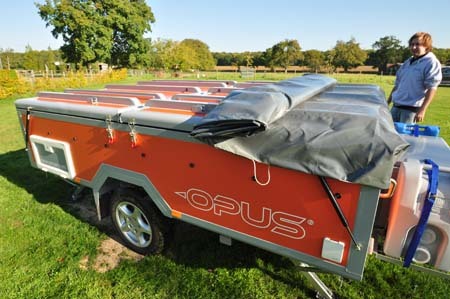 There’s more information on the Opus website www.opuscamper.co.uk. There’s even a video showing how easy it is to setup up the Opus. 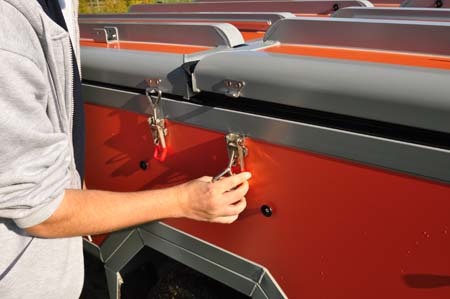 To find out about insuring a folder camper visit our folding camper insurance page and to read up on what security devices you could fit to reduce the cost of insuring an Opus folding camper click here. 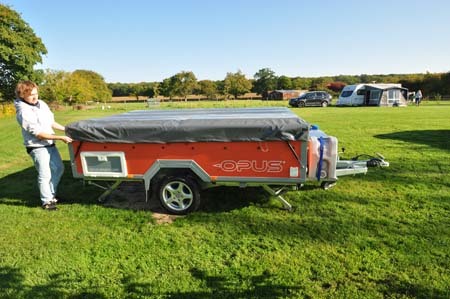 *Folding Camper insurance cost based on Opus folding camper retailing at £12,995 fitted with hitch-lock OR wheelclamp. Kept on drive at HX4 0BE. Caravanners over 30 years old, claim free for 3 years and a member of a caravanning club. £100 excess. 180 days European cover and up to £75 per day for up to 15 days emergency accommodation cover included. Legal expenses cover, extended European cover and other emergency accommodation expenses cover options are available at extra cost. Quote includes 10% online discount and 9.5% Insurance Premium Tax and is correct as of 22.2.16. Mark is yours still for sale? Just want to thank everyone for their interest but we have now sold our Opus. We love ours and have spent very comfortable weeks in the uk and in Germany, France and Holland. Now ready to move up to avan so am looking to sell. 2016 model, with all the extras available. Sensible selling price invited if interested. Karen are you still looking to sell? Love it and really want one!!! But unfortunately I will wait to see if I can get a second hand one as the price is far to high!